For those who don’t get the NFL’s interest in London or think the league’s international reach is something of little interest to American football fans, please understand this: The NFL is determined to establish itself overseas, even if it takes a full-time team in London to do it. On Tuesday, commissioner Roger Goodell was talking about games in London again. He did so at a conference at New York University, but he could have been speaking from any venue over the last several years. Reports from the meeting had Goodell proposing a third regular season game in England, playing in multiple stadiums around the country and perhaps even moving a current team to London. This is really no different from past suggestions of a London Super Bowl or an international game every week. All should be warnings to American fans who brush away talk of an international NFL. The league is very serious about being overseas. The most lucrative sports league in the world, with nearly $10 billion in revenue, has long been trapped by the borders of its own country. For years, the NFL has used its massive popularity in the U.S. to extract billions from American television networks. But there is also a worry the American networks will someday reach a ceiling and the Atlantic and Pacific will prove a far greater impediment to the growth of football than sports like soccer or basketball or even baseball and hockey. Showing NFL games on television in cities like London and Frankfurt never worked. Neither did the springtime developmental league that played to unenthusiastic crowds unmoved by the splendor of watching American minor leaguers wallow through five-yard runs in the mud. Seven years ago, the NFL – desperate to find an overseas foothold -- hired an international marketing executive named Mark Waller, who spent time attending games in the U.S. and realized the best way to sell the NFL overseas is to have people experience real games with top players and see the passion of those teams’ fans. He decided they needed to see American football culture. When Waller and I talked about this in 2007 – not long after his arrival to the NFL – he spoke of European fans wanting to see the real NFL, not a series of exhibitions or minor-league games. He said he believed international fans would adjust to a strange sport if they could feel it the way we do in the U.S. He made a comparison to Pepsi, saying the soft drink company first pushed itself overseas at a time when no one was interested in carbonated drinks internationally. “It took time from when it was introduced to when it eventually got embedded,” he said. He said he believed the same would happen with American football. Once Europeans got a feel for the real product, there would be a hunger for more. In the six years since, his approach has been successful. 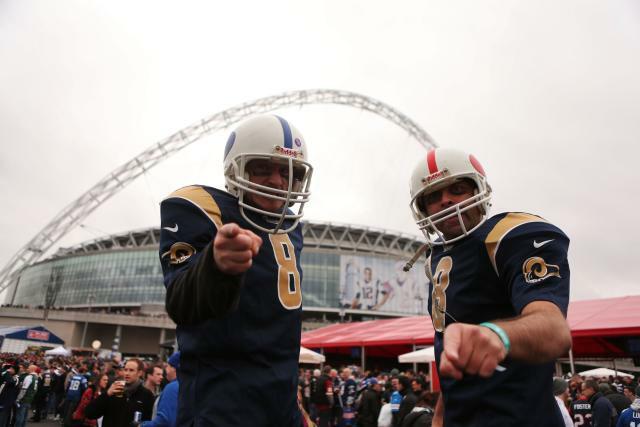 The six games the NFL has played in Wembley Stadium since 2007 have been sellouts, drawing between 76,000 and 85,000. The league continues to push itself on London figuring the city to be the closest match to an American city given the common language and reasonable travel distance. Last fall, the office of the city’s mayor suggested the NFL could fill the abandoned stadium from last summer’s Olympics with a fulltime franchise. But the drive isn’t just for London. Never did I grasp the urgency of the NFL’s overseas drive until I was standing in a driving rainstorm in Loudon County, Va., with a Taiwanese band named Mayday and a group of children playing flag football. The game, played in 2009, was part of an American tour the NFL arranged for the band, which is popular in China and Taiwan. The idea was to have the band members experience American football as they were filmed for a multi-part reality show to run on Chinese TV. The league had targeted China as a sort of blank slate, a potentially lucrative nation with few of its own sports leagues and millions of younger people fascinated with America. As with the games in London, the NFL officials behind the series said they were trying to sell the NFL’s culture, believing the experience will be as attractive in other countries as it is here. 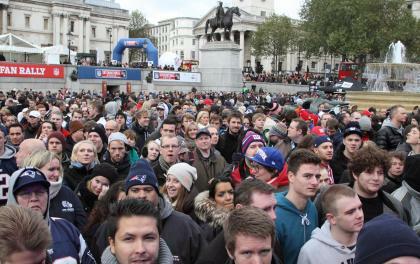 So, yes, the NFL is serious about London. It is serious about Asia. It is serious about taking our most American sports product and peddling it overseas until someone buys it. Maybe this is something American fans don’t want, preferring to see the American game as an American-only institution. The league does not agree. The London talk will keep coming. More games are going to the UK. And it’s only a matter of time before games will be played in other European cities. Change is coming to the NFL we know. The American game is about to be more than just an American game. • Watch: Is RG3 doing too much?